In February 2018, CAG began an engagement with the Madras School of Social Work (MSSW), an autonomous college located in the city, to make their campus zero waste. This report presents the findings and recommendations from the preliminary waste audit undertaken by the CAG team along with the staff and students of MSSW. Apart from deaths and taxes, there is a third certainty in life - garbage or solid waste. Yes, the smelly stuff we choose to keep out of sight and out of mind, is a reality that needs urgent attention. When it comes to waste, efforts tend to focus on cleanliness drives that prevent littering. No attention is paid to what happens after the waste is collected from our homes and streets, and disposed in dumpyards far from city centres. This ‘Not In My Back Yard or NIMBY” attitude has severe impacts that are experienced throughout the city in the form of polluted air and contaminated groundwater, which are not limited to the dumpyard. Those living close to these dumpyards and handling waste also experience the ill effects from the mountains of waste generated everyday. In this public meeting, we will discuss the multiple problems of the current SWM system and the resulting negative impacts on the human rights of city residents. Dumpyards: Dumpyards are sites for disposing waste and are the oldest form of waste management. Kodungaiyur and Perungudi are Chennai’s main dumpyards. These highly toxic lands are in close proximity to human habitations and expose residents to physical, mental and social stress. The chemicals in the waste harm those who are handling waste, and also contaminate air, water, and soil. By negatively affecting human life and environment, dumpyards deny people their right to life and right to clean environment. Cost of managing plastic waste: Collect and dispose systems tend to focus on the responsibility of consumers and governments, and the cost is borne by the public. Plastic, by virtue of its low recyclability and indestructible nature, remains in dumpyards and the environment forever, leaching toxic chemicals into the soil and nearby water bodies. When producers make the choice of materials and processes of production for their products, packaging and delivery methods, they should also be held accountable for the impacts from the entire lifecycle of the product - from making plastics, to using plastics in products, packaging and delivery, and their disposal post-consumption. SWM Contracts: Chennai Corporation’s SWM contracts usually require the contractor to collect waste from the doorstep, street sweeping is fraught with poor performance of the contractor, improper waste management, and financial burden on the city. Despite the poor track record in Zones 9, 10 and 13, Chennai Corporation will now privatise SWM for the entire city. This will result in many conservancy workers losing employment, and the public will have to bear the burden of expensive but poor service. Waste workers: Conservancy workers face the looming threat of privatisation, inadequate wages and bad working conditions that have been observed in previous privatisation efforts. Informal waste pickers, who contribute immensely to diversion of waste from dumpyards and support recycling, experience social stigma attached to their work. Because their occupation is not recognised by the government, they also constantly experience threat and exploitation from local authorities and residents. Technological solutions: Chennai Corporation is pushing for waste-to-energy (WTE) plants as a way to manage the city’s waste and plastic problem. This involves mass burning of waste and plastic which produces toxic smoke even after passing through various cleaning equipment and this smoke is ultimately released into the atmosphere. Using plastic in roads construction and cement kilns also entail burning. These methods are a gigantic waste of valuable materials, and pose a grave danger to our health, environment, and economy. An SWM system can be holistic and sustainable only if all the links in the system from producers to consumers to governments and citizens are established in accordance with their roles and responsibilities. To make this system equitable, economically and environmentally sustainable, it is important to consider the human rights impacts for all communities. Such a system should incorporate the following core principles, which have been written in accordance with internationally accepted definitions of concepts and norms related to sustainable SWM as adopted by bodies such as the European Union. The Right to Life which requires a healthy and pollution-free environment as enshrined in Article 21 of the Constitution of India. Inter-generational equity so that we do not compromise the ability of future generations to live healthy and sustainable lives. Decentralised waste management that is in accordance with the Proximity Principle, which holds that waste should be disposed of or managed close to the point where it is generated. Polluter Pays Principle to ensure that the generator of waste is primarily liable for waste management and the costs associated with it. Fair labour practices that ensure that all individuals employed or engaged in the execution of SWM are treated in accordance with national and international labour norms, including the concept of ‘decent work’ used by the ILO. Informal sector inclusion to include, integrate, or accommodate wherever possible, informal sector workers, such as waste pickers, who are dependent on waste for their livelihoods so that they can enjoy their Right to Livelihood. Waste hierarchy ranks waste management options according to sustainability and what is best for the environment. Top priority is accorded to preventing and reducing waste production. If waste is not produced, then there is no question of disposal. When waste is produced, the hierarchy gives precedence to preparing it for reuse, followed by recycling, then recovery, and last of all, disposal. Environmental sustainability to ensure SWM is environmentally sustainable. Target-oriented management for timely compliance with all rules and regulations. 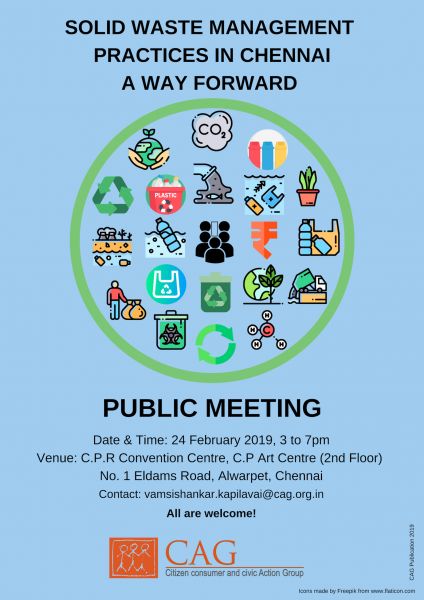 CAG cordially invites you to this public meeting to inform yourselves, discuss the failures of the current system, and explore a way forward for a holistic and sustainable waste management practice for Chennai that is based on principles of equity and justice. The proceedings of the discussions will be shared with relevant public authorities to inform policy and practice. ECO Niwas Samhita 2018 - an Energy Conservation Building Code for Residential Buildings (ECBC-R). The BEE (Particulars and Manner of their Display on Labels of Self-ballasted LED lamps), Amendment Regulations, 2018. The report covers the road safety status across 180 countries and looks at measures being taken up to reduce road accidents. An illustrated booklet that explains some of the basic road rules of India with the reasoning behind the law.